Every Christmas season when I was growing up, my mother and I would bake cookies. Sugar cookies, oatmeal cookies, gingerbread. I remember standing at the kitchen counter, stirring the dough, and sitting at the dining room table painstakingly decorating the cookies. I remember packaging them up to give them to neighbors and family and friends, because there is something particularly wonderful about sharing homemade gifts with the people you love. These small things — a little flour, a little butter, maybe some nuts and spices — create lasting memories of love and giving and happy holidays. Unfortunately, there are many children in America for whom even these small things are out of reach. This year one in five children will go hungry. They won’t get to create the happy memories that the rest of us take for granted. And that’s why I’m honored to be a co-host of Share Our Strength’s 12 Days of Sharing Campaign. Every day for 12 days, a different food blog will post a baking recipe, creating a virtual cookie swap. The event is organized of Jennifer Perillo of In Jennie’s Kitchen – you can check out her blog for more information on the 12 Days of Sharing Campaign and also find the Virtual Cookie Jar where you can find all of the delicious recipes contributed by food bloggers. All these recipes are posted to encourage you to think about the kids who don’t get to bake cookies this holiday season: if you can afford to make a donation, please click on the badge below and donate whatever you can to Share our Strength. Just $25 will feed a hungry child three square meals a day for a month, but any amount helps put food in the mouths of children who need it. Any donation will also make you eligible to win any number of great prizes as well. If you have a food blog, you can participate as well by posting your own cookie recipe and link to the 12 Days of Sharing Campaign — details can be found here. 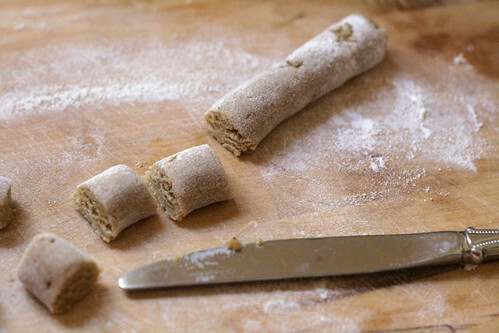 The recipe I am contributing is one of my favorite Christmas cookies — the unpronounceable pfeffernusse. German in origin, these small spice cookies are unusual in that they contain ground candied orange peel and no butter — they bake up quite firm, and are excellent with milk or a hot toddy. They ship beautifully, store for up to a month at room temperature (and improve with age) and are easy for little hands to help make. I let the Nuni help me roll and cut them — I hope she can create her own happy Christmas memories. Place the flour, almonds and orange peel in the food processor, and process until all the ingredients are finely ground. Add baking powder, salt and spices. Whisk together eggs and brown sugar, add flour mixture in thirds and stir with a wooden spoon until incorporated. Chill dough overnight, or until firm. To form the cookies, on a floured surface, roll a piece of dough about the size of a golfball into a rope. Using a dull knife (I like the shape created from the slight flattening of a dull knife) such as a butter knife, cut the ropes into lengths of approximately 1 inch. Place the cookies 1 inch apart on parchment lined cookie sheets, and optionally allow to dry overnight. Preheat oven to 350 and bake the cookies about 15 minutes or until brown around the edges. 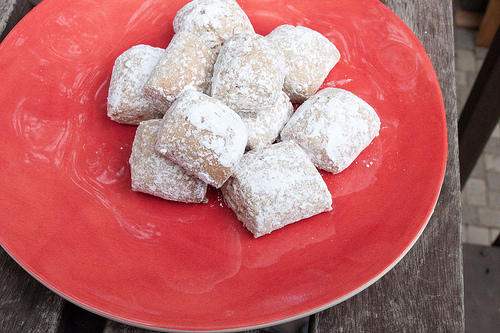 While the cookies are still warm, toss in powdered sugar. Ripen for a week in an airtight container with a slice of apple. I’ve never made or even tasted this cookie but it sounds lovely. I love all those spices and the fact they can be made ahead. Great post! Pfeffernusse is one of my favorite holiday cookies! Thanks so much for this recipe, along with these great resources for sharing with others.